Earlier this year we shared our Wooden Spoon Family, so what did we do with our left over spoons? Well we could have used them in our house but what fun would that be? With Halloween right around the corner, we decided to do something fun with them. 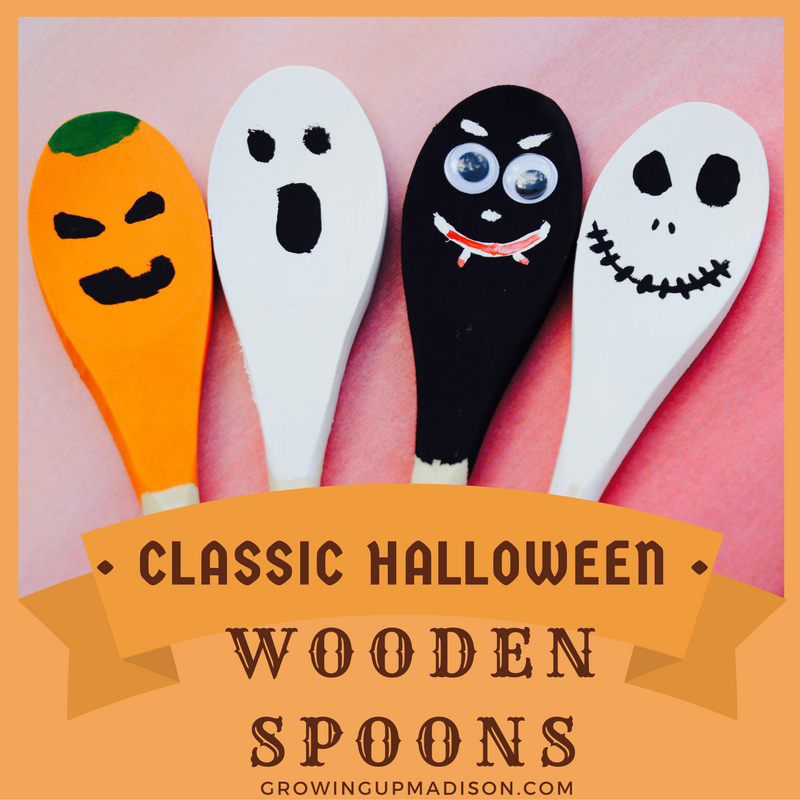 You can totally get creative with wooden spoons and while I loved our spoon family, I have been thinking of other ways we can use them and this Halloween season was perfect. I decided on doing classic Halloween characters and what's more classic than a Jack-o-Lantern, Ghost, Vampire and of course our lovable Jack Skellington? The Nightmare Before Christmas is one that we watch yearly and of course one that should be in your Halloween classic movie collection. Now you don't need to be an artist to do this, I am no artist and my pieces are of course done by an amateur, ME, but your pieces will be uniquely yours. Madison even made a green witch. 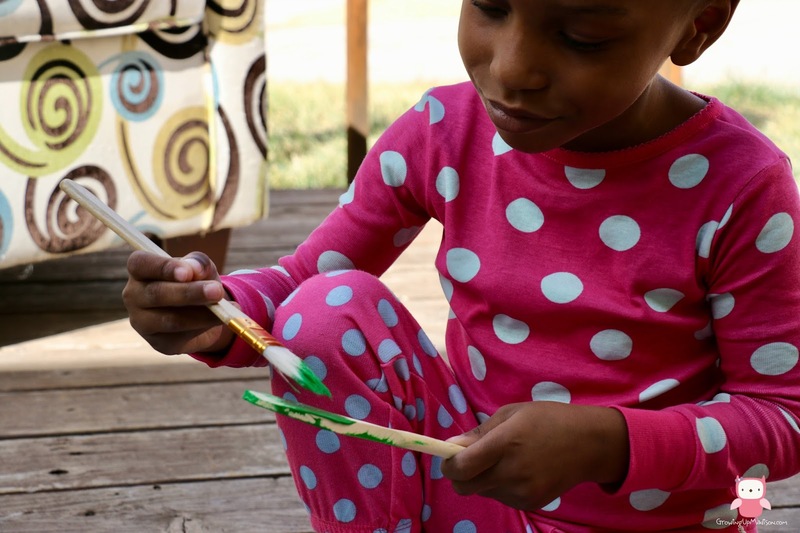 Get the kids involved and get your crafting on! 1. 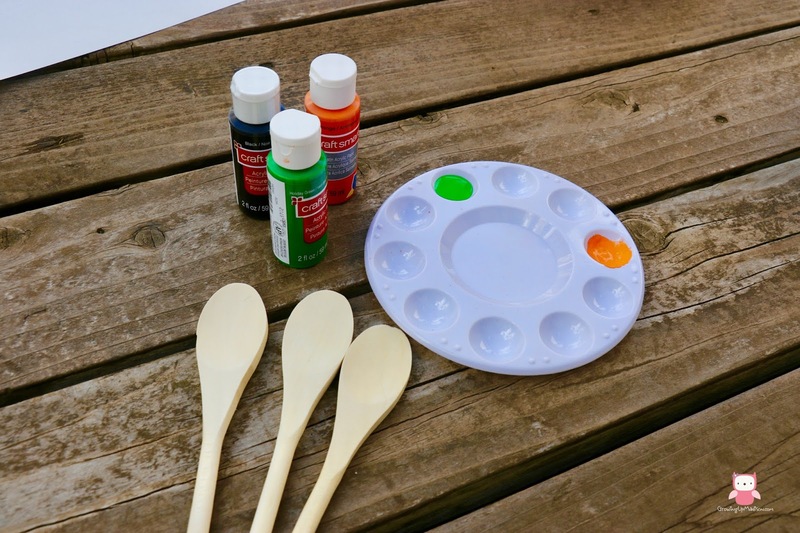 Start off by painting your spoons in your desired color. For example for my Jack-O-Lantern I painted it orange while I did my ghost in an obvious white. A simple google search can show you templates of what each may look like, but you can freehand it and do it just however you please. Madison decided on doing a green witch and a zombie, both painted green. You can use a smock to protect your little one's clothing if they are going to be helping, or just use water based paint which can be easily washed from hands and clothing. 2. Next draw the faces on. You can either use paint for the eyes or the googly eyes which Madison used for her witch. Googly eyes are simpler for little children, for those who like to "do it myself". If you decide to make your own witch, you can use yarn or even pipe cleaners for her hair (like we did for our Wooden Spoon Family) but we decided to forgo that. This is a very simple and easy craft that you can do together with your little one's. Painting helps with hand and eye coordination and letting them do it themselves, helps to foster independence. It also gives them a sense of pride, so be sure to add their very unique creation to your own, and display it proudly, no matter how much you may be laughing on the inside, because it looks nothing like they said it was. Well Madison said the witch looks very much like me and I have to agree. Thank you Madison! Let's discuss: What have you been up to for Halloween? These are so cute and adorable! The girls will have so much fun doing this project. Thank you, be sure to help out too. The girls will have fun doing them with you. Those are so cute! I love creative decorations like this for any holiday. They're so much fun! Thank you Stacie, so do I.
Ok these are so cute!! I have a 5 year old daughter who would have such a fun time making these. So easy and creative. I may need to purchase some extra wooden spoons! The wooden spoons are too terribly expensive and I buy the craft ones on Amazon. What a cute and creative DIY decoration. This will be a fun project for me to do with my niece and nephew. You'll all have fun for sure and just let them get creative. I've decorated the house and the outside for Halloween. Such a festive and fun holiday. I'm loving your spoons! We've only decorated indoors, we haven't done outdoors as yet and not so sure I'm doing so yet. Oh my gosh. 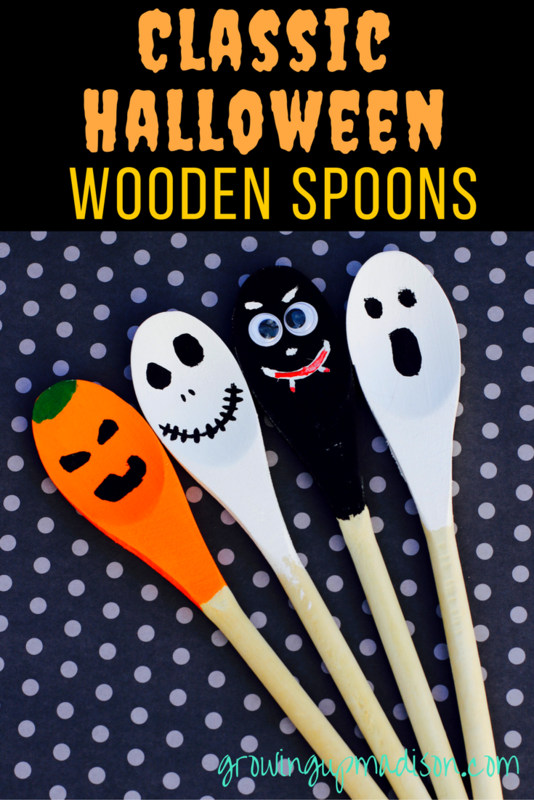 These wooden spoons are so cute for Halloween! I know my 6 year old would love to paint and decorate spoons just like these. Yes they are and my 4 year old had a blast. THESE spoons are too cute!! I love how easy this craft is and how amazing it turns out! Perfect for Halloween! I'm all about easy, if it's too difficult, you won't see it on here. Those spoons are wonderful! I want to make some with my kids! :-) However, I think I'll let Mr. Foodie handle this one. I's not very handy with the craft making stuff. Madison is completely adorable. Thank you and you should give it a try. You'll surprise yourself. These are super cute. I love how easy they are to make. I would have never thought of this. Oh they're super easy and just think of other Halloween characters and make your own design. What a fun DIY for the kids to help with! My daughter's old preschool did something like this for Christmas as a gift for the kids in the cooking class. Oh that's cute. I like when the school sends home gifts the kids make. These are so cute! I love this craft idea and my little guy would have fun doing these, plus there's so many possibilities! Oh the possibilities are totally endless! Those look so cute! I would love to do this craft with my kids. And you should! What's stopping you? 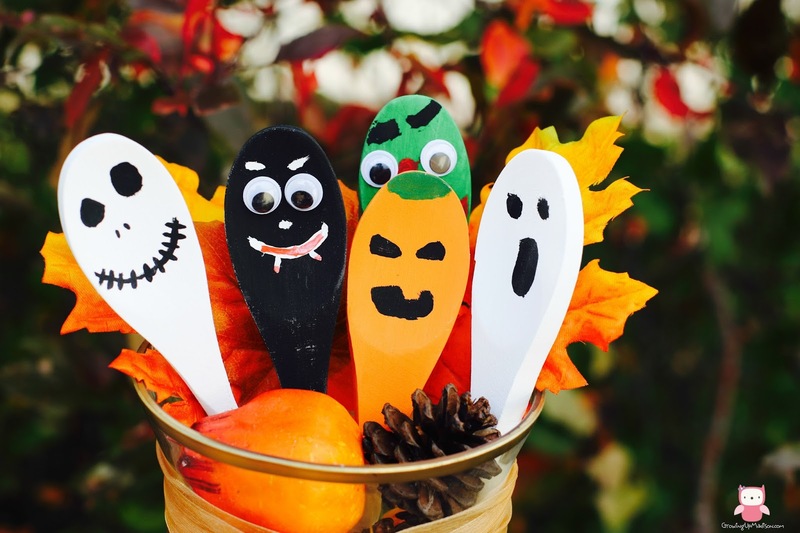 This is such a stinking cute Halloween craft! My daughter would have a blast making these!!! And you should have a blast right along with her. Aww, these are super cute. I love all the little monsters. What a fun little family craft. Yes it was fun making it along with her, and we had a great time. These wooden spoons are adorable! I would never have thought to use them like this. My kids will love doing this for sure! Oh there are so many ways you can use spoons as crafts and I'm going to have to place an order for new ones. These are really cute! I love your idea. I love Halloween and the simplest decorating ideas like this are the best. I love decorating with our own stuff instead of buying. It also gives me time to spend some quality time with her. What a fun activity to do with the kids. Also perfect for them to put on a puppet show with these characters! Oh yes it certainly is. A puppet show would be great too! What a fun idea! Those would be great in the planter boxes or plants around the house for Halloween decor. Didn't think of planter boxes. What a great idea! Jack Skellington is also my favorite and one of the easiest to make along with the ghost. My mom had decorated wooden spoons that she would put out for Christmas. I love your Halloween variety. Such a fun way to add some festive decor to your house. I'm also planning on doing some for Christmas as well. Just think of the possibilities. This is such a fun craft idea for the little ones. They could even use them as puppets when they're through! Yes they can and you can all put on a puppet show together. And you should have some fun doing it with the kids next weekend. After all Halloween is almost here. This will be perfect to do with the kids this weekend. My friend is bringing her little ones over for me to babysit. I will have to get some wooden spoons for them this week. Were you able to do them? We didn't do much this weekend but we'll be doing some more for Thanksgiving and Christmas. What a fun Halloween craft idea! We are big fans of The Nightmare Before Christmas movie, so a Jack Skellington spoon would be a must. Oh we are big fans ourselves too so of course we had to add Jack Skellington in ourselves too. They look so cute! 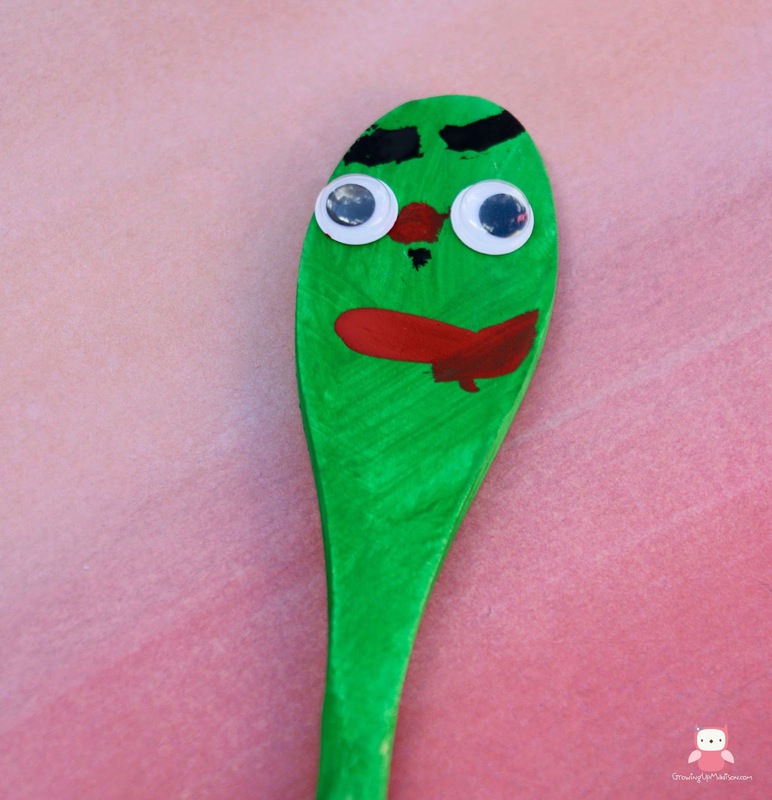 I bet my son will love doing some of these spoons! You should get him involved, he just might have a lot of fun. OHHHH, now I'm thinking if I have time for my 6 year old to do this craft. Its easy enough and I've got the spoons. Thanks! As long as you have the time and the supplies, go for it! These are soooo fun! I totally need to make these with my twins! We love to craft and these are a great frugal craft!!! Go for it and have a blast with the twins! I love that you let the kids get in on the decorating. Those are so cute and they did such a good job! Well it was just one child and she really enjoyed it. OMG these are adorable. I'm in love with that Jack Skellington one. I think I might be making some for Halloween and Christmas too. I can just imagine Santa and Snowmen. Love, Love, LOVE it! Thank you Adrienne, I'm thinking Santa, Snowmen and even reindeers. We'll just have to see. Our favorite restaurant gives you a number so the wait staff can find you and they do it on a wooden spoon. Des delights in the fact that they decorated wooden spoons. I imagine he would love to make his own. You should totally have Des make his own. I think it'll turn out amazing! Oh that Turkey Wooden Spoon family would be fun to see. You should do it! Omg these are so cute and creative! I should do this with my kids they would love this. Oh I can see your kids getting creative with their spoons. You should let them have fun and do it with them. This would be a great activity I could do with the grandkids over the weekend. My granddaughter loves working with paints and she's going to be so proud of her creations. Thanks for sharing the idea. That's the thing that I love about crafting. Their pieces are all unique and they're so proud when they're done. This bought back good memories of me making these in school. Great idea for a Halloween party! I never did anything this cool in school, our crafts were usually boring. This is WAY to cute! I have to do this with my littlest she will love it. Thanks so much for sharing. You're very welcome and if you do it with your little one, you should share it with us. This would be perfect to do with my nieces. We are going to have so much fun! Oh I can see you guys enjoying yourself doing this. Have fun! That is true, makes a great decor! Oh these are cute. It would be a great activity to keep the kids busy. Let's see if I can engage my son with this activity this weekend. What would you be making? Hopefully he'll have fun with you.